This week I continued to make good progress on my novel — now up to 40,000 words — and perhaps as a result I’m not so interested in writing about writing. In my last post I went on and on about summer movies, and now I’m going to talk about my new favorite TV series, House of Cards. My son and I were looking for a fun show to watch during the long, dreary interregnum before The Walking Deadresumes in October, and I’d heard good things about Cards. 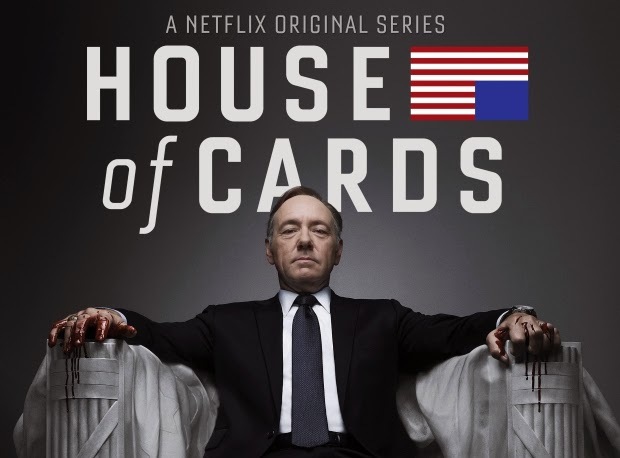 If, like me, you’re a latecomer to the series, here’s the gist: Frank Underwood, a Machiavellian congressman from South Carolina, executes a sequence of increasingly dirty tricks to gain power and outmaneuver opponents in Washington, D.C. Underwood is played by Kevin Spacey, and he’s the main reason for watching the show. My favorite part is when he turns to the camera and directly addresses the audience. I know this technique is as old as Shakespeare, but it still works. Frank adopts a completely different tone for these soliloquys, a voice that’s knowing and evil but also bracingly honest. “I despise children,” he admits. “There, I’ve said it.” He also badmouths the president, the vice president and just about everyone else in D.C. As he outlines his schemes for the TV viewers, you can’t help but think of Richard III plotting his assassinations and seductions. (“Was ever woman in this humor wooed? Was ever woman in this humor won?”) The resemblance is so strong that it must be deliberate. The creators of the show clearly wanted to stage an updated version of a Shakespearean history play, with all its naked brutality. There are also strong hints of Macbeth. Frank’s wife Claire, played by Robin Wright, is supposed to be equally cunning and amoral, but like Lady Macbeth, she has a little trouble living with herself. By the end of Season 1 (my son and I haven’t progressed to Season 2 yet) she seems to be yearning for something more meaningful. Unfortunately, this makes me like her less rather than more. I can’t really see inside her head. She doesn’t indulge in soliloquys, so I don’t know what she’s thinking. Many of the secondary characters are also weak. Frank’s mistress, an ambitious reporter, is too young and witless. Claire’s paramour is a complete caricature, an English photographer who sounds like a cut-rate Jude Law. Worse, a few of the plot points made no sense at all. During one of the episodes Frank’s machinations trigger a nationwide teacher’s strike, which is utterly ridiculous; teachers are organized on the local level. And at one point Frank delegates a fellow congressman to carry out an unsavory task that could’ve been much more easily accomplished by a private investigator or by Doug Stamper, Frank’s wily second-in-command, who is also my second-favorite character in the series. It was poor plotting, a shame. But Kevin Spacey’s performance makes up for all the flaws. In fact, it’s almost as good as Bryan Cranston’s performance in Breaking Bad. The two shows have a common theme, the realistic and intimate portrayal of evil, and viewers of both series will find themselves rooting for the bad guy. All in all, though, I think Breaking Bad is the better series, mostly because it leavened the dark proceedings with humor. Cranston was very funny at times, and so was Aaron Paul (his confession about “the problem dog” was one of the funniest and saddest speeches ever written for television). House of Cards is also somewhat educational. My son is fifteen now, and he needs to learn how our government works. I tell him not to worry if he doesn’t completely understand the plot (which, as I just pointed out, doesn’t always make sense anyway). The important lesson here is that politicians will stop at nothing. Being a wee bit of a history nerd, I greeted the news confirming that Richard III’s bones had been dug up in a parking lot in Leicester with great excitement. I mean how often do we get to rehabilitate one of history’s greatest (and many argue much maligned) villains? No doubt we will soon see a rash of new books, both fiction and non-fiction, on dear old Richard and there’s even talk (no surprise) of a movie. What I love most about the ‘mythology’ surrounding Richard III is the passion it raises. For me that’s what makes history come to life – real people and real questions over what they did or did not do (always more interesting when allegations of murder are thrown into the pot as well!). From Josephine Tey’s Daughter of Time to Sharon Penman’s Sunne in Splendour and Anne Easter Smith’s A Rose for the Crown, I’ve always loved reading interpretations of Richard III’s life. Who knows what other new evidence will come to light now we literally have his bones to study (for instance, they have already put together a facial reconstruction of what he would have looked like and confirmed Richard did indeed have curvature of the spine). The next logical step in the possible ‘rehabilitation’ of Richard III would be to locate the bones of the princes he supposedly had murdered (rumoured to lie beneath Westminster Abbey). I just love this kind of stuff! So what would you like to see as the next ‘coolest grave’ to be discovered? How about Genghis Khan as some have suggested? Rumor has it British archaeologists have their sights of uncovering the remains of both Alfred the Great and Henry I but I’m not sure how much public excitement either of these ‘finds’ would generate. What famous bones would you like to see unearthed?